Dubois plant reopens | Glenn O. Hawbaker Inc.
DUBOIS – Pennsylvania has addressed the deferred maintenance of roads and bridges across the state. In the fall of 2013, legislative leaders made transportation funding a priority. State Rep. Sam Smith of Jefferson County was stalwart in his support of the Act 89. “We are beginning to see and feel the effects of Act 89 passed by the legislature in November of 2013” said Dan Hawbaker, president of Glenn O. Hawbaker Inc.
Act 89, he said, is scheduled to provide funding for roads, bridges and infrastructure across the commonwealth and into the future. “Our state had been operating for several years in a constrained budgetary environment that has not allowed the state and municipalities to keep pace with necessary repairs and construction,” Hawbaker added. 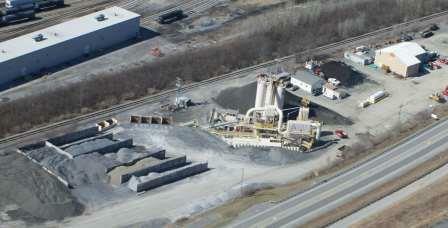 As a result, Glenn O. Hawbaker Inc. will re-open its asphalt production facility in Dubois. The plant has been closed for the past two years; its re-opening is the direct result of Act 89, said Hawbaker. According to him, the state Department of Transportation (PennDOT) has an increased construction schedule. And, Hawbaker will be hiring workers at its DuBois plant. “It means more employees to drive trucks, more people to work on paving crews, more skilled jobs to work on bridge construction,” said Hawbaker. Hawbaker, he said, currently has 95 job openings across the state in a variety of job categories. The company’s total employment, he added, could exceed 1,200 people in 2014. “Another positive aspect of these new job opportunities is that they are all local,” said Hawbaker. “The Act 89 is action on the part of the state of Pennsylvania supporting Pennsylvania jobs.